Foodies, are you ready to feast… …your eyes with me? The excitement of tasting and reviewing not 1, not 2 but 11 F&B restaurants covering cuisines from local to Taipei, Korea, Japan and New York!! Oh yes, we were feasting nonstop for 6 hours! Beat that! To all my fellow OMY bloggers who feast the storm food with me, WE DID IT!!! We are the champions! You are in for a treat! 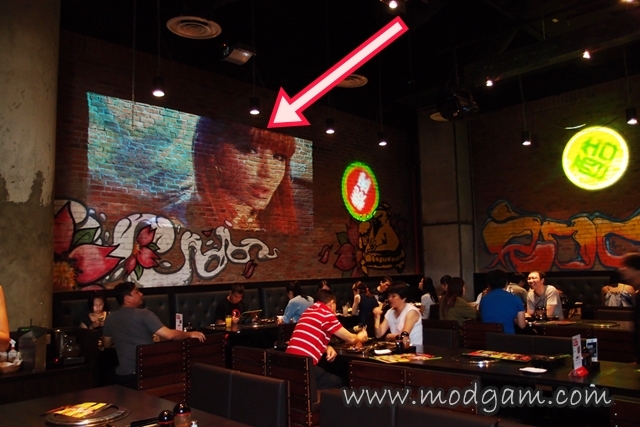 Bugis+, formerly known as Iluma, is the new Orchard! I am always on a lookout for new food places and boy am I impressed with the variety of cuisines served! Missing Taiwan? 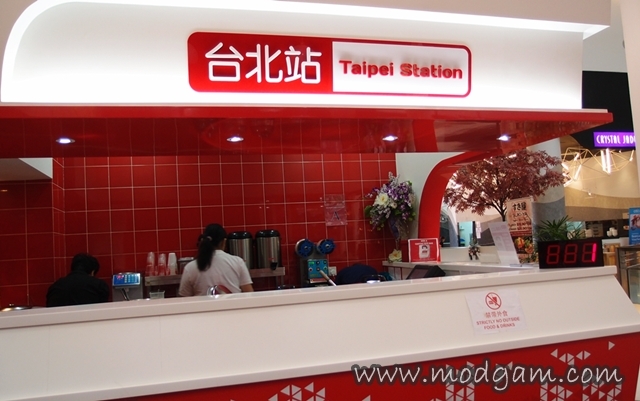 Have been wanting to try Taiwanese famous street snacks? You don’t have to get an air-ticket just to taste some of those! Head over to Taipei Station at Bugis+ and you feast on Oyster Rice Vermicelli (orh-ah-mee-sua), Braised Pork Rice, Crispy Chicken (ji pai) and Bubble tea!!! 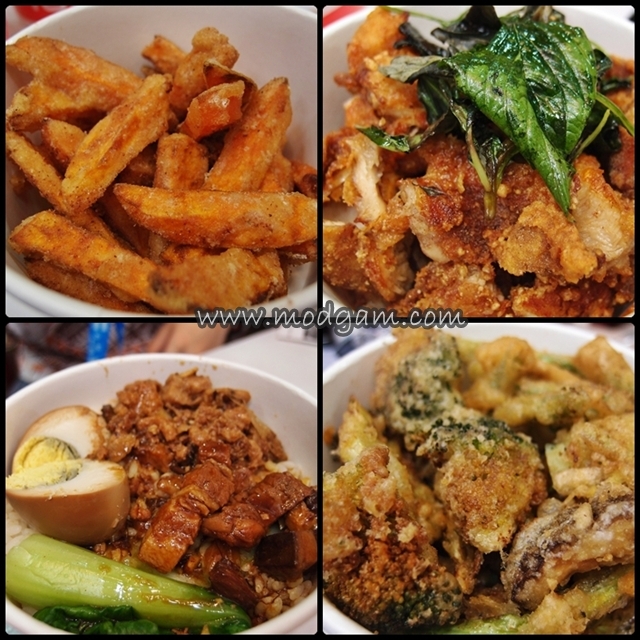 Clockwise direction: Sweet Potato Fries S$3.00, Original Crispy Chicken S$4.20, Braised Pork Rice S$4.90 and Crispy Vegetable Combo S$4.50. 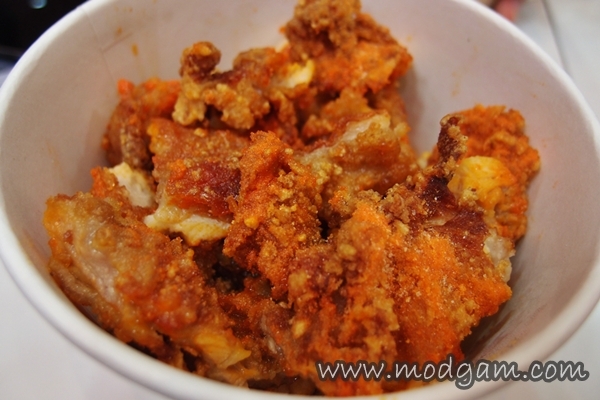 Cheese Crispy Chicken S$4.50 – this is one of the star items, must try! Honey Oolong Milk Tea with Pearl S$2.80 – premium tea leaves are also imported from Taiwan for the refreshing and fragrant bubble tea! 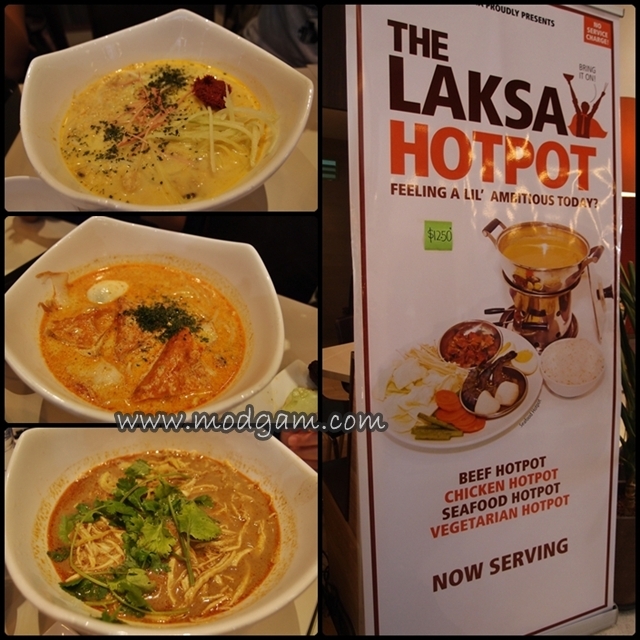 Laksania is pronounced as laksa-nia with a hokkien accent. It means they sell only Laksa here! Creative isn’t it? I was just browsing their website and I can’t wait to head down again to try their Laksa burgers, Laksa pasta, Laksa rice and hotpot! Laksa with a social cause! Laksania is a social enterprise that was started in 2008. Their social mission is to help people who have been marginalised by their mental or physical disability to gain employment. They believe in the saying: “Give a man a fish and you have fed him for today. Teach a man to fish and you have fed him for life”. They employ the marginalised and enable them to earn a living using their own efforts. Hence, they set up a central kitchen in IMH to hire and train IMH clients. Kelantan Laksa – Kelantan laksa is served with thick rice noodles and generous amounts of fish meat. Sliced cucumbers, laksa leaves and homemade fresh chili paste are served on the side. Singapore Laksa – Our Singapore Laksa packs a punch with its awesome flavour and spiciness. Guaranteed to satisfy your laksa cravings! Sarawak Laksa – Originating from the Malaysian state of Sarawak on Borneo Island, Sarawak laksa is spicy and flavourful, with prawn and chicken broth served with fine rice vermicelli. 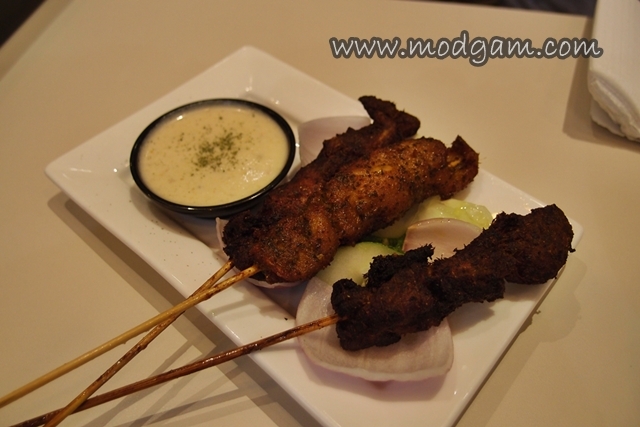 Chicken Satay with laksa soup based dressing – very interesting for I have never tried dipping laksa sauce with satay. Refreshing and very laksa! C-Jade HK Cafe IN brings fun, casual Hong Kong Fare to Bugis+ along with familiar Hong Kong Cha Chan Teng favorites such as ‘Cart Noodles’ also known as ‘che zai mian’ and crispy Macau Pork Chop Bun (ju pa bao). Everyone knows how much I love HKG and now I know where to get that craving curbed! Chilled HK Milk Tea S$3.90 – The right combination of tea, milk and sugar makes the perfect cup of smooth fragrance milk tea! One of my must have whenever I visit HKG! 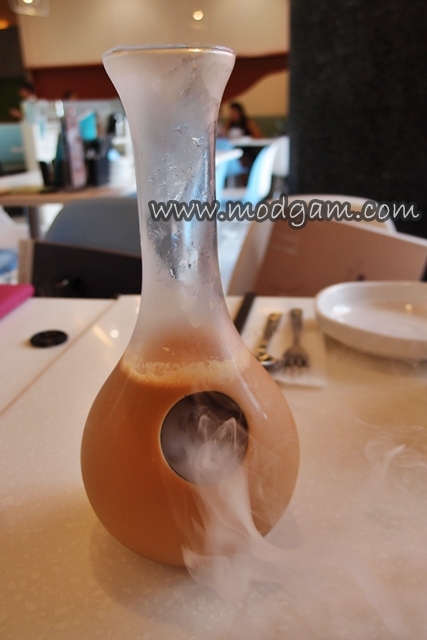 This milk tea makes a dramatic entrance in a swirl of dry ice and served in shot glasses! 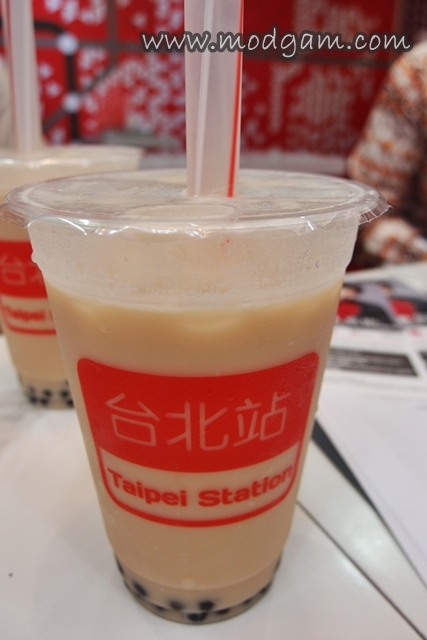 Drinking milk tea has never been this fun! Old Time HK Biscuit S$2.00 (3pcs) – A luxury snack for kids in Hong Kong back in the 60’s; 2 plain crackers with malt sugar as filing. Best eaten with holding the stick just like a lollipop. Corned Beef & Cheese Toast S$4.80 – Sliced bread top with salted corned beef and cheese! Yums. Crispy Macau Pork Chop Bun S$4.80 – The other MUST EAT if you were to visit HK but this version is a fusion mix if you ask me. Interesting and equally yummy! Deep fried pork chop with sliced cucumber, tomato, lettuce and crispy bean curd skin! Deep fried Spring Chicken with Fries & Lemongrass S$8.80 (half), S$16.80 (whole) – Deep fried spring chicken with a hint of lemongrass served with generous portion of fries. Hong Kong Cart Noodle S$4.00 – Filled with puff beancurd, half egg and vegetables. You can add a large selection of side ingredients like cuttlefish, fish and chicken sausages. 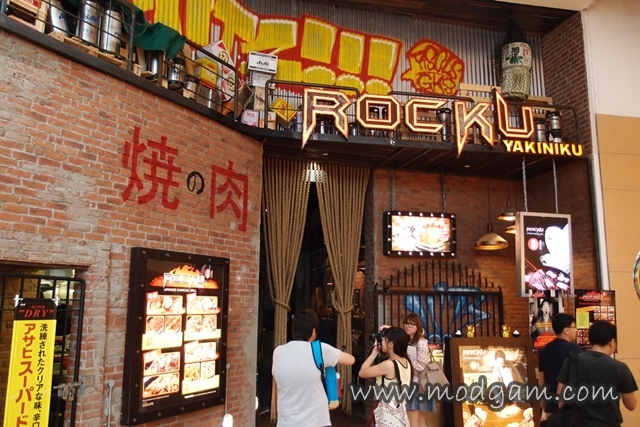 ROCKU Yakiniku is a casual, upbeat and edgy Yakiniku restaurant at the new Bugis+. 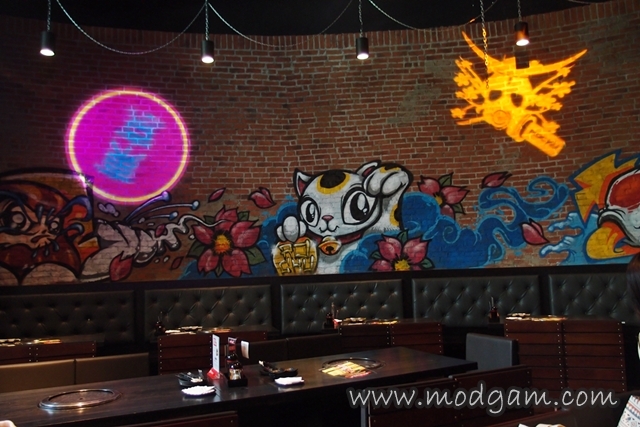 From the fun Japanese inspired Graffiti wall to the unique MTV videos projected on the wall, one can’t help but feel as though they are really having the Japanese Charcoal Grill in Japan. 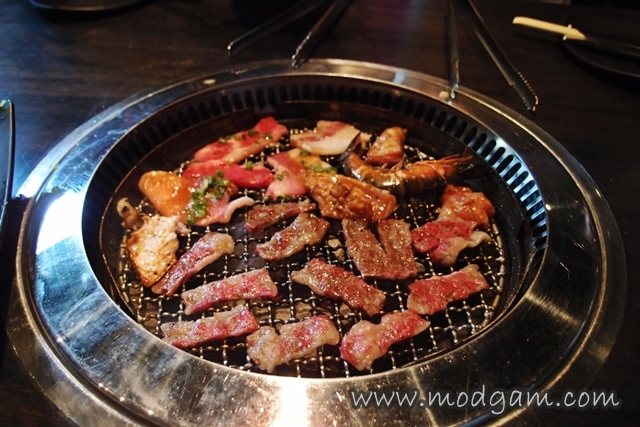 I am a carnivorous and I fell in love with the wide variety of tantalizing meat, ranging from beef to pork and chicken. Flown in from the USA, Australia and Japan, premium cuts such as Wagyu beef brisket, Australian sirloin and short ribs cater to all meat lovers! Rocku BBQ Prime Set S$68++ for 2 – Comes with Rocku Salad, Salmon Sashimi, Miso Soup with Mushroom, Wagyu Marbled Beef, US Black Angus Rib eye, Kurobuta Pork Belly, Kurobuta Pork Sirloin, Teriyaki Chicken, Tiger Prawn, Teriyaki Saba Fish, Assorted Mushrooms, Garlic Rice, Mochi ice-cream! 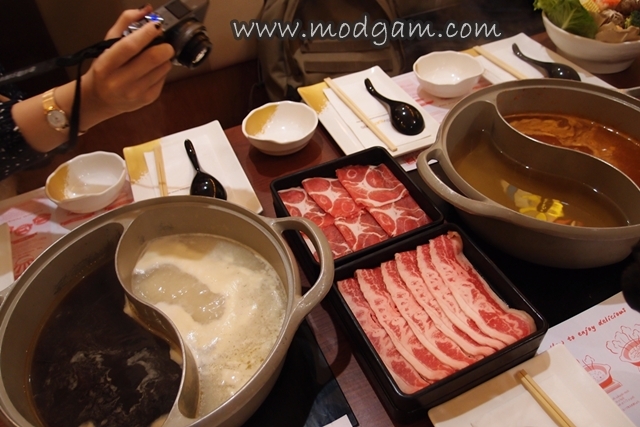 I’ve always love the sweet Sukiyaki sweet soup based and I’ve enjoyed my shabu shabu a lot more now! 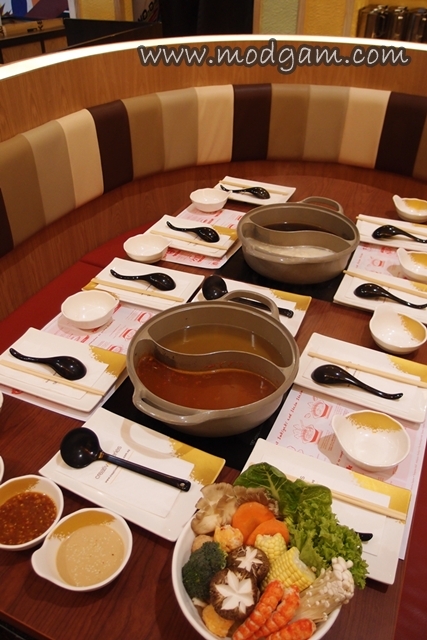 Here at Suki-Ya, you can choose from 4 different type of soup based; Shabu Shabu – Ponzu Sauce (Shoyu Vinegar), Tonyu Miso – Sesame Sauce, Soybean Paste and Kimchi. 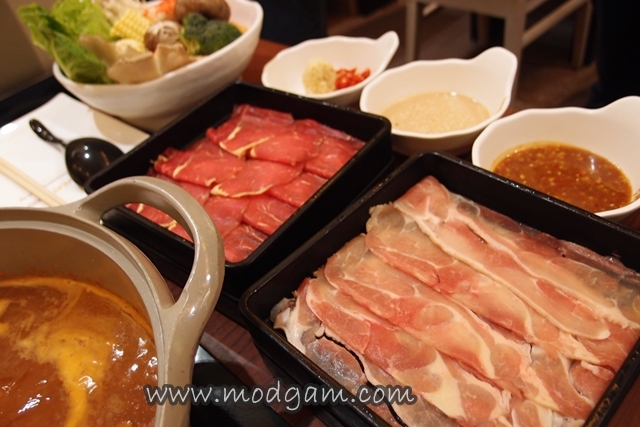 With top-quality chilled beef and pork in paper-thin slices along with a wide variety of vegetables. I am in love! One of the all the time favorite among customers and the bloggers at my table is the chicken cheese meatball! Be careful when you take a bite for the hot cheese sauce might burn your lip. I’ll see you tomorrow Cheese meatball! 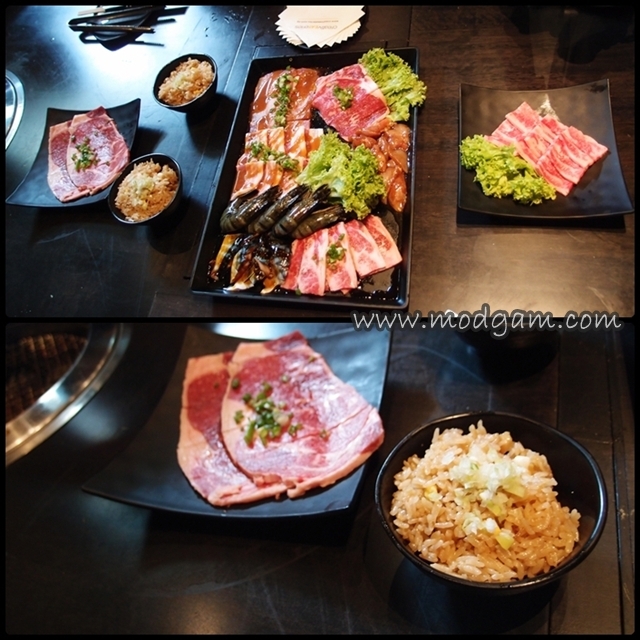 ROCKU Yakiniku looks interesting, but be very new or hidden. Never seen before. The food looks good! Wow! 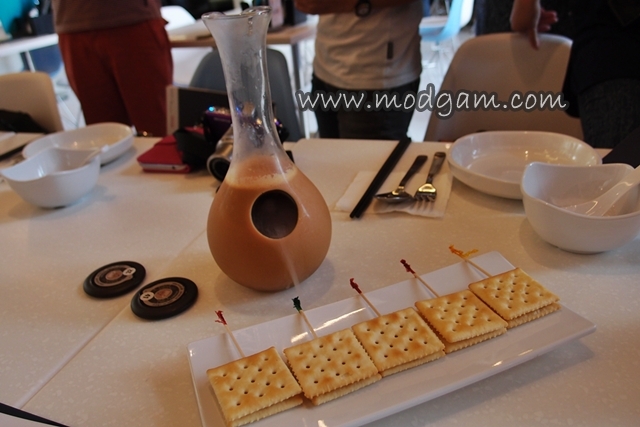 Bugis+ Food Trail with omy bloggers – 11 food places in 6 hours! 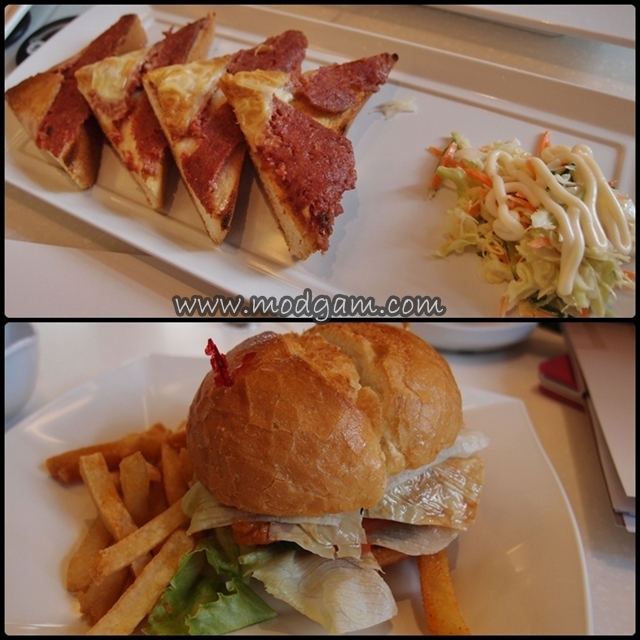 Part 2 | Modgam's Playground; Fashion, Food, FunFinds. hey, twin sister what have you got here?!!! all goodness that makes me more excited for our singapore trip come last week of march-first week of april. must try at least few of those yummy! eleven food shops in 6 hours? i envy you for enjoying omy! yoz twinnie! hahahaa yes, we will bugis+ the day away! 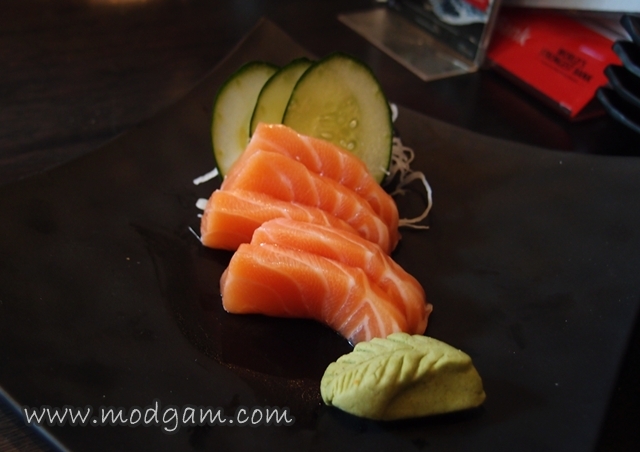 I am so in love with the few restaurants that i am going back again this and next week! yummy yum yum! i thank omy for the opportunity too bro. WOW I would have had to fast for days before and after so many foods in so little time! LOL you must have an elastic stomach! That’s not to say I wouldn’t give it a damn good try if I was offered a vegan food marathon lol but I’d probably take a lot home for later! 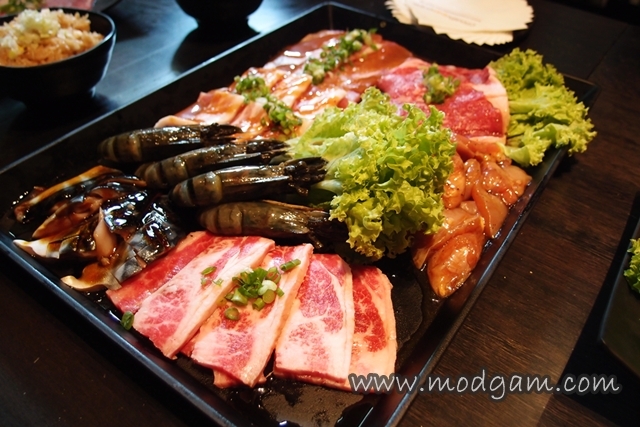 ROCKU Yakiniku – More than 30 dishes to choose from only S$27.90++ | Modgam's Playground; Fashion, Food, FunFinds. 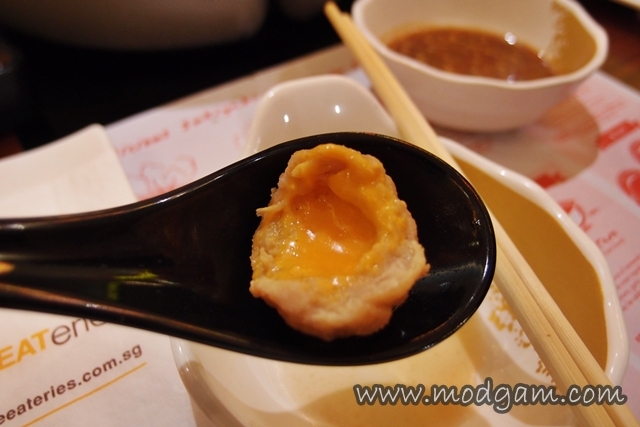 Xiao La Jiao Sichuan Cuisine @ 112 Katong Mall | Modgam's Playground; Fashion, Food, FunFinds.